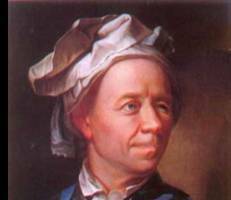 As an adult, Euler spent much of his time in St. Petersburg and Berlin. He is considered one of the most amazing mathematicians of all time. He has contributed any amazing amount to the field. Function notation: f(x) = x + 3 replaced y = x + 3. This notation states that x is a function of f(x). A simple explanation of what this means can be taken from an analogy to a car. On a more advanced level, Euler is credited with pushing forward the use of a power series as a way to represent a number with an infinite sum. Finally, Euler made substantial progress with number theory and is said to have paved the way for another famous math person, Carl Friedrish Gaus. Return from Leonhard Euler to other Famous Math People.